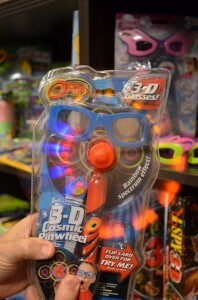 I’ve loved 3D and optical “tricks” since I was growing up in Utah. One of my favorite restaurants there had place mats with puzzles and optical illusions. I also loved it when one of the local television stations here in Memphis would have a special showing of a 3D movie for Halloween. I’d put on my paper glasses with the red/blue lenses and park myself in front of the TV and would wow and ah for the next couple hours. More recently I’ve gotten into ChromaDepth 3D and do a lot at one of the haunts here in town- Haunted Web of Horrors. But do you ever wonder where all those paper glasses come from? Some friends and I did after a trip to Florida, and we found out it’s actually very close to home! 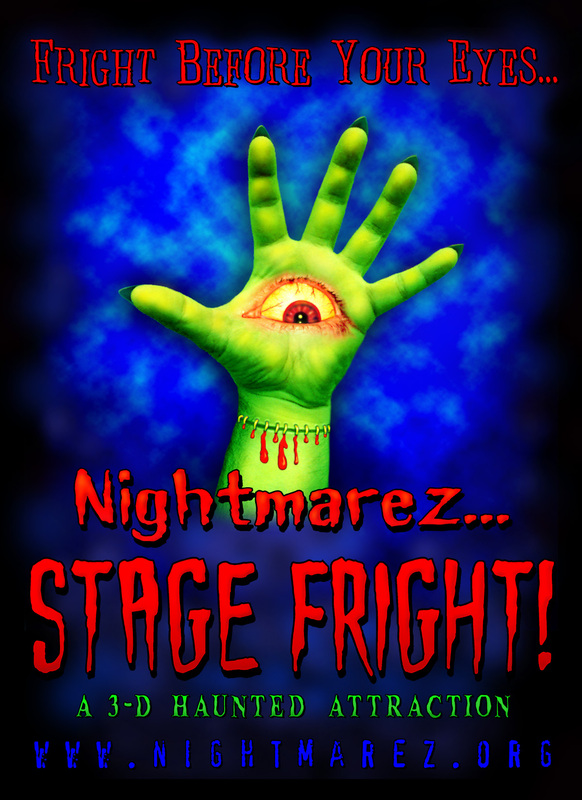 A few years back some of my Nightmarez…STAGE FRIGHT! (now Haunted Web) haunt co-horts and I made a trip down to Busch Gardens’ Howl-O-Scream in Tampa. 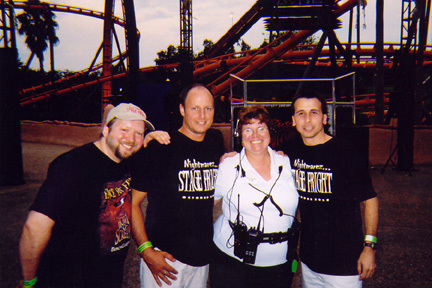 While we were there we met Robbi Parsons Lepre– an awesome lady who turned out to be Director of Theatrical Services at Busch Gardens. When she found out we were haunters we hit it off. 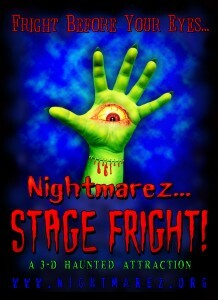 We told her about our charity haunt and raved about Howl-O-Scream and how much fun we were having there. We were wanting to catch a show called “FIENDS” and there was one showing left that night, but it was on the other side of the park. Robbi showed us a short cut and later arranged for one of the “Naughty Nurses” in the show to come out and take a photo with us (can’t find the photo right now but the one above is one I took at the show and they were in 3D, sorta- enjoy!). 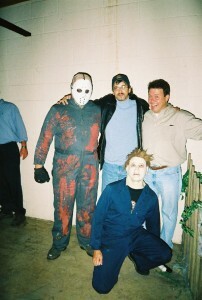 The next year Robbi met us after the dinner show with some Howl-O-Scream t-shirts and asked if we’d like to go through the haunts with the fire marshal as he did his inspections. We said, “Sure!” We were impressed at how little the fire marshal found that needed changed, and how quickly the Busch Gardens crew got the corrections made of the few things he did want to see done. They know their stuff and it was a great learning experience for us. While we were at Howl-O-Scream that year we got to go through a new 3D haunt. They gave us some paper ChromaDepth glasses as we entered and were blown away by the 3D effects in the haunt. The glasses had clear lenses and made the bright neon colors pop off the walls, props, and actors in the haunt. On the way out they had a bin you could toss your glasses in, but I held on to my pair. There was a web address on the side of the glasses I wanted to check out when we got back home- www.3dglassesonline.com. 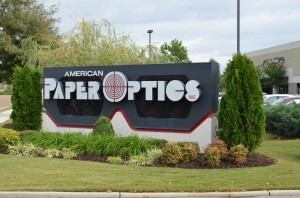 It turns out that the website belonged to American Paper Optics in Bartlett, TN- about a mile or two up the road from our haunt! 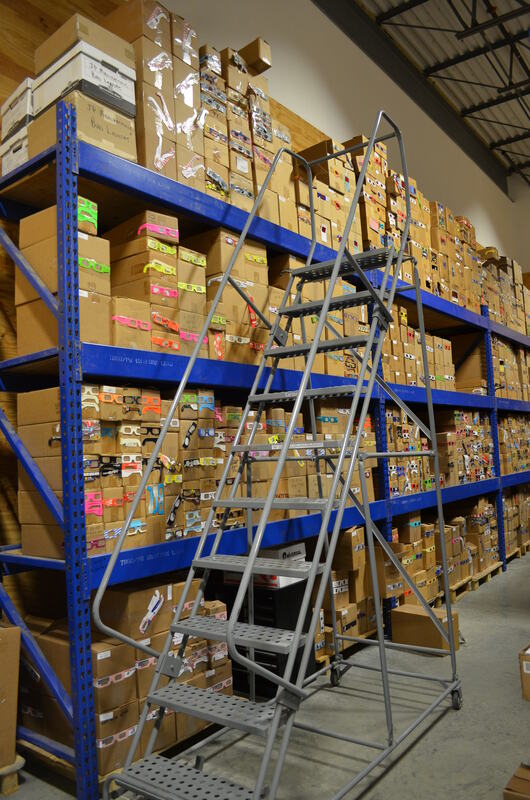 We had traveled to Florida to find out about a company right here in our own back yard. We contacted them and got a tour. 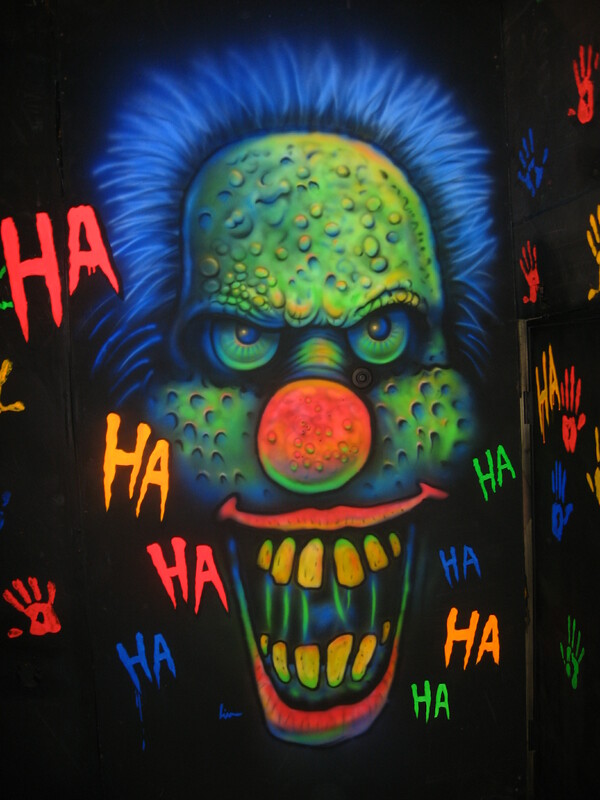 That next Halloween season we incorporated 3D into our haunt. It didn’t take long to get the hang of how ChromaDepth 3D worked, at least for what we needed it to do. 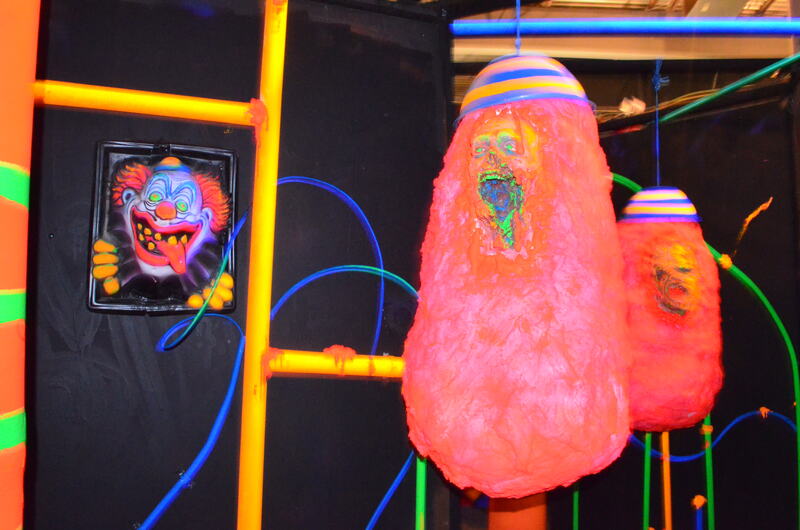 I was also surprised at how different effects, depth, and layers could be achieved with the black light paint and how you painted it on the walls or objects. Red appeared closest to you, then yellow, green, and finally blue. Other colors like orange, teal, and purple fell in between depending on how much of the other colors were in them- more red they were closer, more blue they seemed farther away. Add black between the colors and you get a layered effect. Fade the colors together and get a smooth transition- especially when using an airbrush. And with ChromaDepth, size does matter and affect how you see the object- bigger for close objects and smaller for further ones. Add red to the bigger objects and throw some blue on the smaller ones or in the background and the 3D effect comes right off the walls or floors and seems to float in front of your eyes. 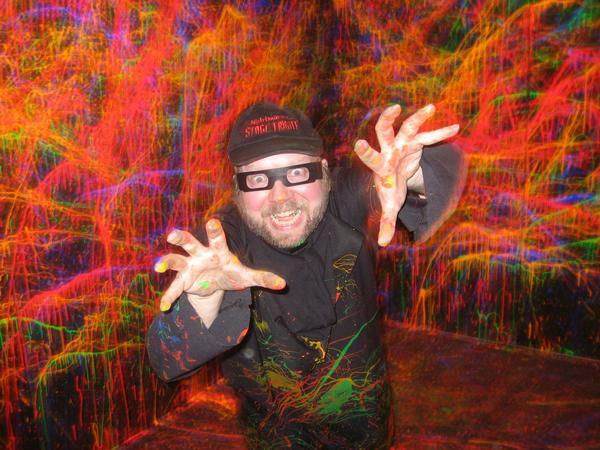 We invited APO’s owner John Jerit and his employees out to visit the haunt- many had never been to a 3D haunt before. When I asked John how they all liked it he said many of them wouldn’t come back. I asked, “Why- did they not enjoy it?” He said, “No- you scared them too bad. They’ve been talking about it all week!” Well, I guess we did our job too well! The next year we got a 3D Vortex tunnel and have added more effects each year. 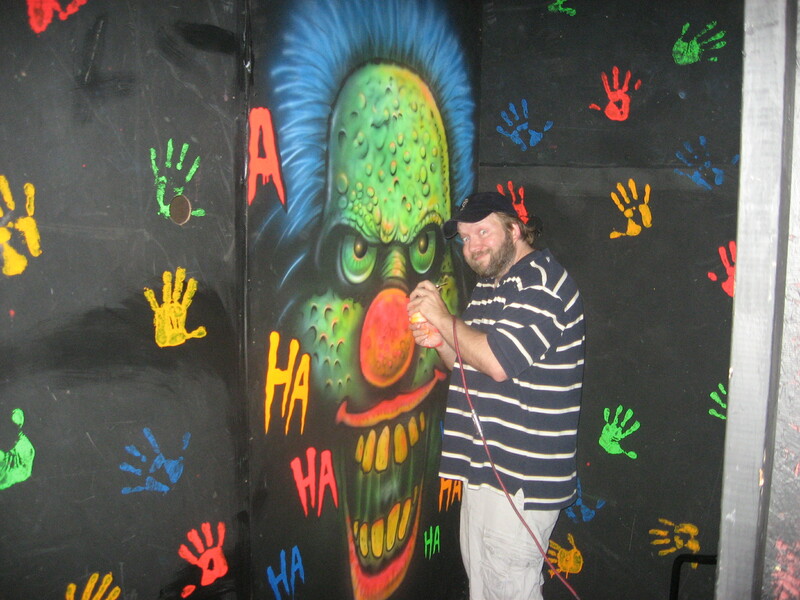 A few years ago Haunted Web expanded into their current location and decided to open two haunts in one- an asylum called Tormented, and a separate 3D haunt- Dark Matter (less gore, more sensory effects- and clowns!) 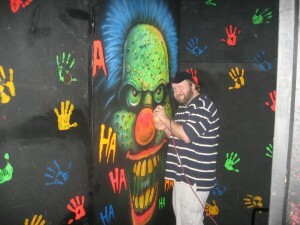 It worked out great for Haunted Web and really helped with adding to the amount of foot traffic and money raised at the haunt. Each year more and more is added and builds on the 3D experience. 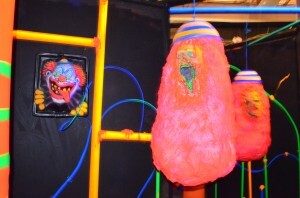 This year a 3D laser was added to the mix, along with a 3D midway and rotten cotton candy body bags. 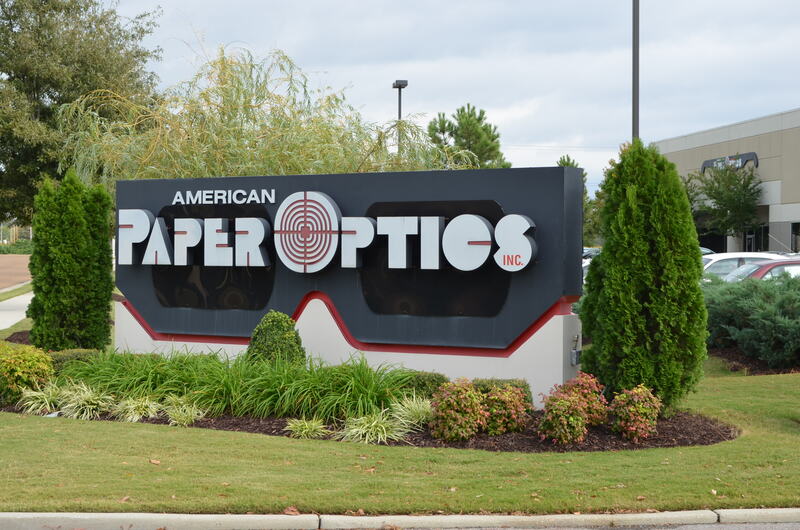 Recently I had seen some buzz on the internet and in some local Memphis magazines about John and American Paper Optics, so I decided to give him a yell and see about taking a tour of their new location which was just around the corner from where I had toured a few years before. 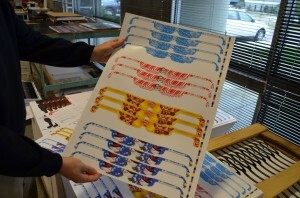 He sent me some samples and magazines featuring the company and invited me out to see the new digs. The company has really grown! 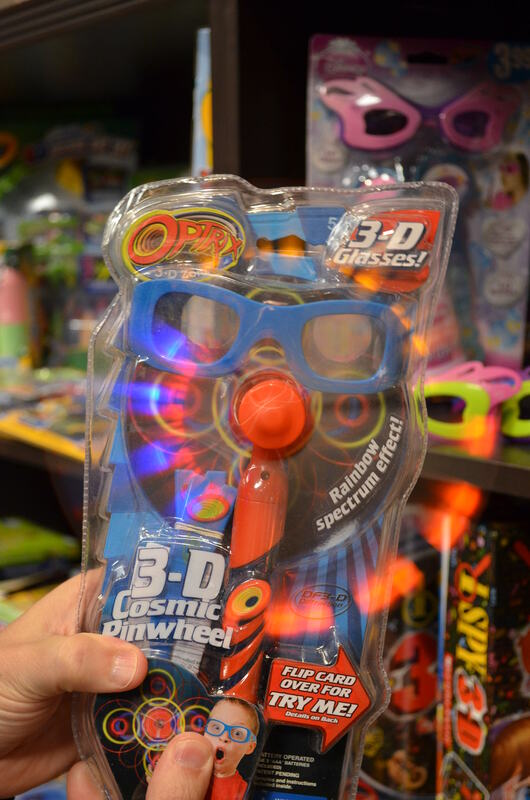 The company started 20 years or so ago after John had received some fireworks glasses in the mail. John bought 7000 of the glasses to sell at Memphis in Mays fireworks display, and then 13000 more later for a festival in Little Rock. 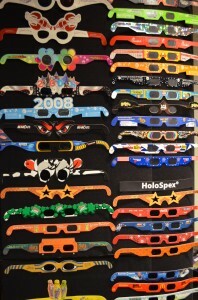 He’s been selling them ever since all over the world and is now the world’s largest manufacturer of paper 3D eyewear. 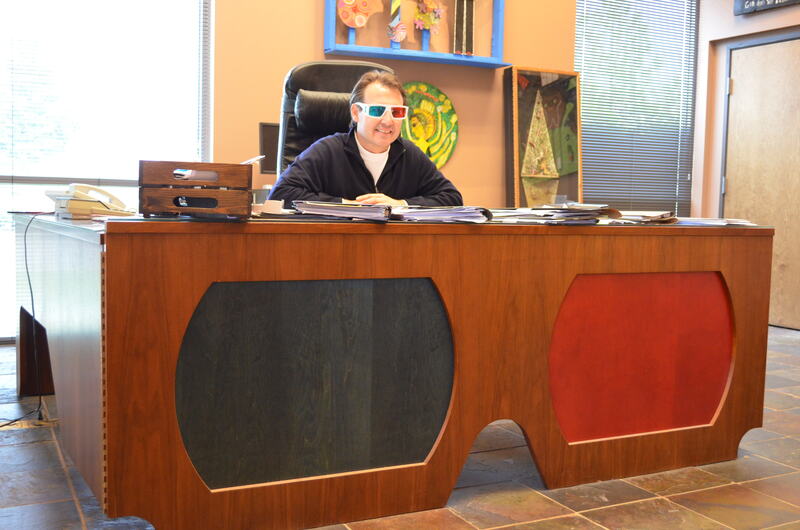 A few years ago he sold 70% of the company to a private equity group, but retained 30% and stayed on as president to run the day to day operations- and kept his 3D glasses desk! One of the first things you notice when you enter APO is part of John’s art collection. He’s a big fan of folk art and it shows- mostly in the hallways and his office. I enjoyed learning about some of his favorite pieces and some of the stories behind them and the artists that created them. He only collects non-trained/self-taught artists which was very interesting to hear. 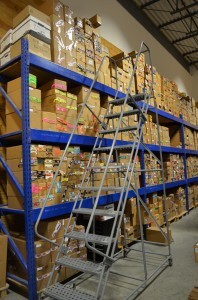 shelves, and displays along the walls on the left and right side of the room. 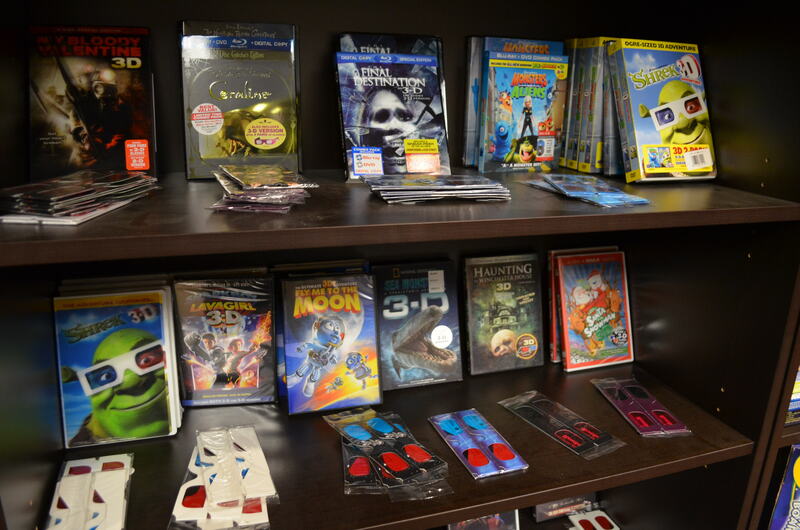 I felt like a kid in a 3D candy store! 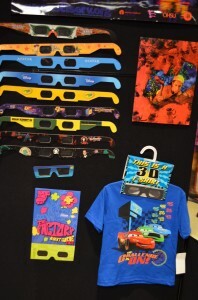 I had always thought of APO as just a 3D glasses company- and the majority of their business is, but they do so much more as I quickly found out. 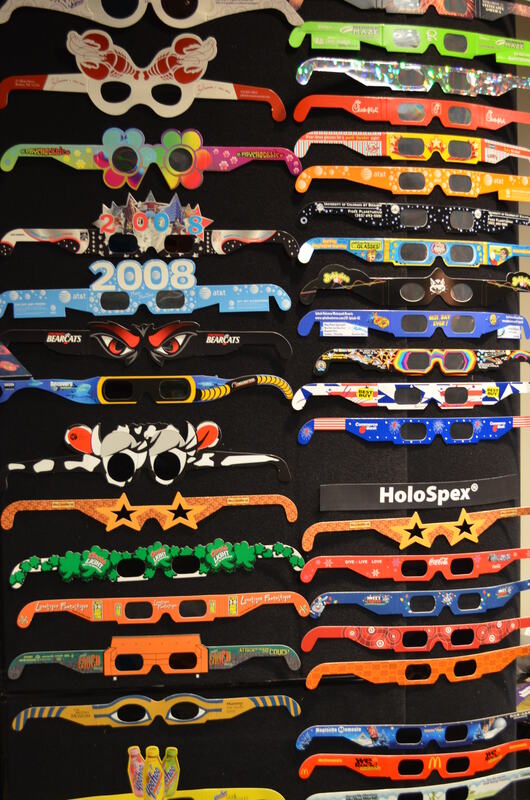 Magazine ads, toys, tees, promo items, mailers, plus glasses for fireworks, eclipses, secret codes, Christmas lights and more filled the room. 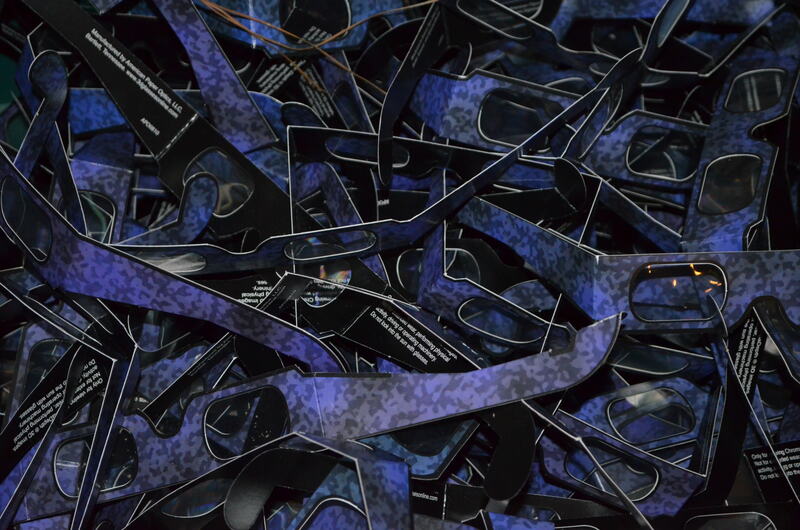 Many with more than just the typical red/blue anaglyphic 3D effects. John explained some of the differences in 3D technology and the glasses to me, then loaded me up with some items before we headed around the corner to the warehouse. It was impressive! They went from about 13,000 sq ft to 27,000 (approximately 5,ooo is office space). The storage part of the warehouse looked as big as the old warehouse and production facility I had been to, and we still hadn’t made it to the new production area yet. When we got there it was big, too- and the company had more than doubled the machines than the last time I was there, and they were all making glasses. There was even an area in one corner where they were being assembled by hand- and quite rapidly I might add! They had also been running two shifts. Again, very impressive. 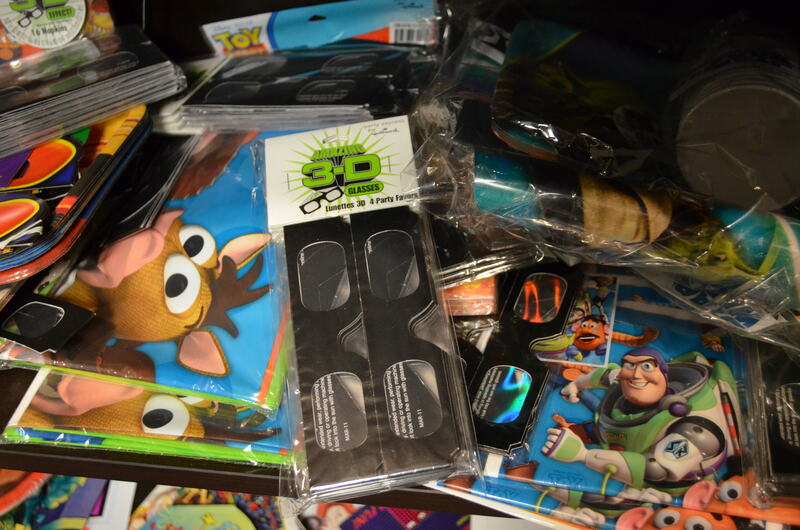 John showed me some of the new items they had been working on, and then loaded me up with more samples to take home- mostly geeky stuff from 3D games, movies, and such. 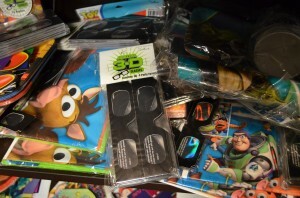 Also gave me a few magazines and an amazing 3D hardback book- “3D Sports Blast!” by David E. Klutho. The photos inside the book are awesome, and some of the best 3D photos I’ve seen. We then went back to his office where he showed me some new 3D technology that doesn’t require glasses! It reminded me of moving lenticular effects, but waaaaay better. Keep your eyes out for it. He also hooked me up with some heart effect glasses for my wedding. They are like the fireworks and Christmas glasses, but when you look at lights red glowing hearts appear. Can’t wait to see those on everybody at the reception! 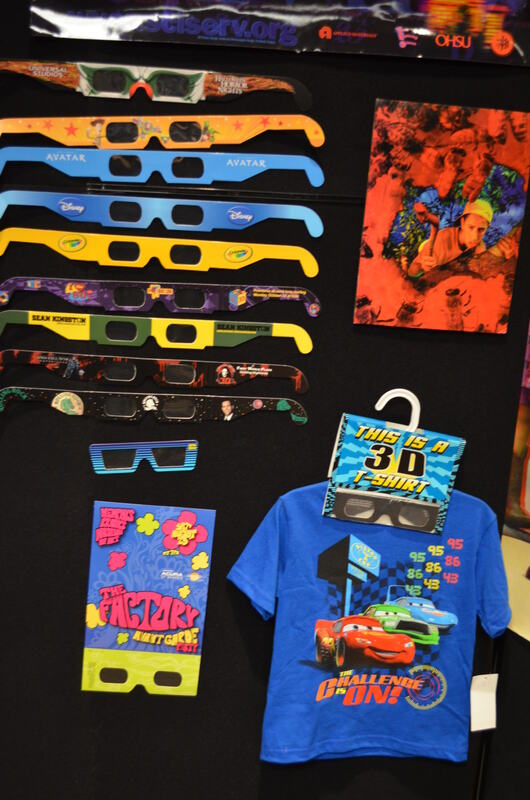 If you’ve got a haunt and have thought about adding 3D, or have a business and thought about advertising using 3D, then give John and American Paper Optics a call. I highly recommend them! The world’s largest manufacturer of paper 3D eyewear.